Capped Bust Half Dollars - A fun series to collect! A fun series to collect! Capped Bust Half Dollars (Lettered Edge) were produced at the US Mint from 1807 to 1836. They represent the first variety in this series. 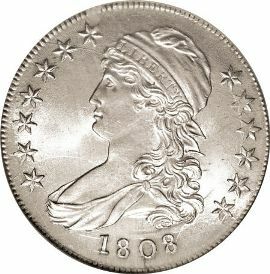 These liberty coins, along with the Draped Bust series that preceded them, are commonly referred to as "bust halves" in the numismatic community. 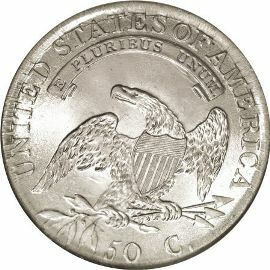 Half dollars of this era widely collected due to the shear number of varieties. Most specialists in this series can attribute each individual coin by the specific obverse and reverse dies that were used to strike the coin. Dies were made individually, that made letter styles, stars, date placements and many other things vary widely. legend "UNITED STATES OF AMERICA"